Since 1915, J.R. Watkins White Cream Liniment works! With As We Change Watkins liniment you can rub away the discomfort of minor aches and pains and itchy insect bites. 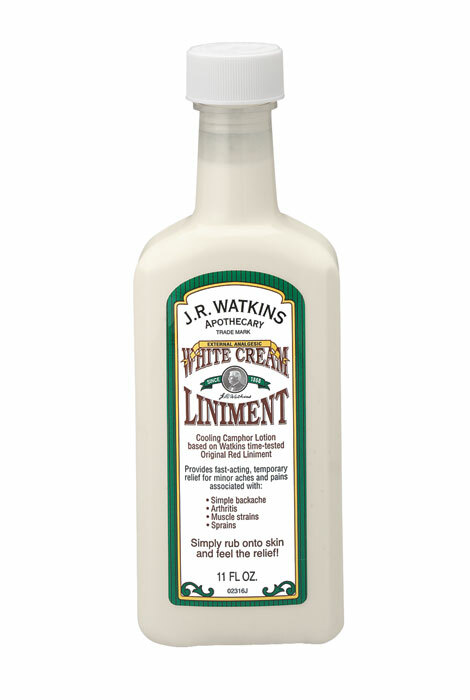 Since 1915, J.R. Watkins™ White Cream Liniment has relied on deep penetrating Camphor as a mild anesthetic and turpentine (the good kind) as a counter irritant. Soothing formula leaves skin soft and smooth. Contains 11 fluid ounces. We apologize for any inconvenience; however, this item is not available for shipment to Canada. Camphor (3.0% w/w), Turpentine Oil (9% w/w) Ammonium Chloride, Ammonium Hydroxide, Mineral Oil, Origanum Oil, Paracymene, Stearic Acid, Sodium Tallowate, Triethanolamine, Water. Because I grew up with Watkins products and I know they work.